Eliot Jennings | Colorado Mesa Univ. Eliot Jennings, PhD, received his Bachelor of Science in emergency administration and planning and went on to earn his Master of Public Administration and his PhD in public administration from the University of North Texas. An assistant professor of public administration, Jennings teaches State and Local Government, Public Administration, Ethics in Public Administration, Public Budgeting, Public Organization Theory, Public Management and Intro to Emergency Management. Jennings teaches both traditional and online courses. He engages students through a variety of approaches, including discussions, the use of case study analysis and student presentations. Jennings' scholarly interests include research on technologies used in disaster response, emergency operations center design and operations, technological hazards and hurricane planning. Jennings' teaching philosophy is based on the belief that great teaching involves more than simply transmitting knowledge. It involves sharing a passion for learning and curiosity with his students, helping inspire them, facilitating the development of their critical thinking abilities and preparing them for careers and life after their course work is completed. He believes this can be accomplished through several basic approaches to teaching. The first is to be passionate about teaching and conveying that passion by being prepared for class, learning new research and trends related to disciplines involved with public administration and enjoying watching students develop. His second approach is help students develop their own critical thinking skills. If he simply teaches students what he knows, their knowledge is limited. By developing their own critical thinking skills, they will be more knowledgeable and better prepared to help solve the issues they will face on the job. Jennings believes evidence-based knowledge provides a sound foundation for learning. He incorporates research articles as well as traditional textbooks in his classes so that students can develop their ability to critically analyze research, the assumptions of the research and the generalizability of it. He takes an interdisciplinary approach to teaching drawing upon the contributions from other disciplines and their application to public administration. Finally, Jennings believes diversity and other perspectives add value to learning. This diversity can come from other disciplines as well as the varied backgrounds and experiences of the students. Prior to entering academia, Jennings served in the U.S. Navy Submarine Service's nuclear power program and as an instructor at the Navy's Nuclear Power Prototype facility in Ballston Spa, New York. He also spent 10 years as the emergency manager for Galveston County, Texas and the City of Galveston. 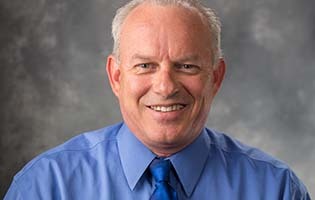 Prior to coming to CMU in 2013, he served as a lecturer in the emergency administration and disaster planning program at the University of North Texas. He has also taught courses for the State of Texas Division of Emergency Management as an adjunct instructor. His personal interests include exploring the great outdoors of western Colorado and eastern Utah, gardening and spending time with his family.